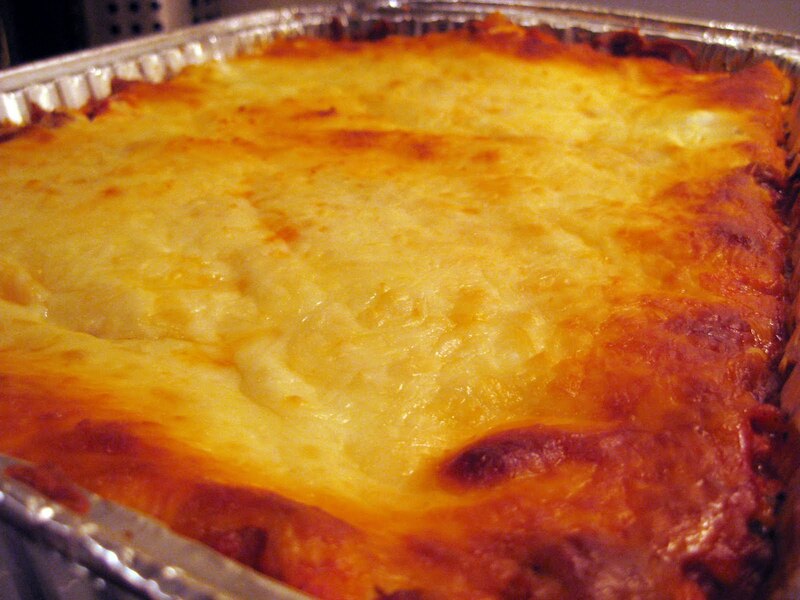 This is my recipe for lasagna, a great meal for when the weather is cold or you need some comfort food. It is based on my grandmother Edna's recipe which, like her sticky buns, people rave about once they have tried it! The surprise ingredient is cottage cheese. I'm not really sure why Gram includes it but I do think it help prevent the lasagna from becoming too dry. One modification that I made was switching from the "old-fashioned" lasagna noodles - which have to be boiled and cooled before layering - to no-boil lasagna noodles which you can simply layer uncooked and they'll cook in the oven! It saves a lot of time and effort. The prep time is about 30 minutes (plus 1 hour in the oven) and a disposable aluminum pan saves on clean-up. If you have the room, it's not too much additional effort to make 2 pans and freeze one. While fresh-from-the-oven lasagna tastes the best, leftovers or from the freezer taste almost as wonderful :) I usually serve with garlic bread and a salad, though this time Eric made broccolini and it went very well together. Generous amounts of seasonings: onion, garlic, oregano, basil, black pepper, etc. This looks great! I love lasagna!